If you roll with long needles, such as 1.5 or 2 mm and you roll densely and push the needles deeply in, it would be safer not to swim the next day, especially if the water is not clean. There is a small risk of getting a skin infection. The risk is very low but I prefer to be on the safe side. Swimming is OK in principle but the protective function of the skin is temporarily compromised shortly after dermarolling and that is why it is easier for bacteria to get into the skin. It is totally safe to shower but if you do not know the cleanliness of the water you swim in, you should be careful. Dermarolling / Microneedling / Copper peptides for stretch marks on stomach? Yes, the masks are excellent for stretchmarks everywhere, but the masks are designed for use on the face only. However, you can squeeze the copper peptides out of the masks and smear them over the skin. It's not a perfect solution but we failed to locate a good supplier for creams, gels etc. Dermarolling / Microneedling / Vitamin C Serum, makes me feel dizzy and dehydrated? Our vit. C is branded "Das Gesunde Plus", a German product for human vitamin supplementation, it comes in a little plastic blue jar in 100 gram quantities and is sold by pharmacies all over Europe. So there is no way there can be anything wrong with the vitamin C.
I have never heard of dizzyness or dehydration associated with vit. C use, not even in Linus Paulings experiments where people were given dozens of grams of vit. C intravenously. You say "apply" so I assume you are not even ingesting it? Applying a vit. C solution on the skin should not cause dizzyness or dehydration, no. I can't think of any reason why that could even happen, as the body contains about 1500 mg vit. C naturally, and it is not neurotoxic in any way - safe in any dose. I am not a doctor, but if you are sure the vit. C is causing you dizzyness then I'd stop it. I am very sceptic that it causes dizzyness though. I just had a teaspoon of the same vit. C in my salad and so far, I feel fine - which is as it should be in everyone..
No, you should not do that because after needling, the skin is extremely much more permeable so you'd perhaps disturb the collagen regeneration processes. Directly after needling, we'd like to only use "natural" substances on the skin, as any harsh chemicals may disrupt the regeneration processes. Needling by itself does not pollute the skin, so there is no need to "sterilize" the skin after needling. Only after use. After the overnight soak in Chloramine-T, you rinse the roller/dermastamp/needle under tap water and let it air-dry. Keep the microneedling instrument in a clean, closed container. The instructions explain this in detail (you should rinse the device after use with some warm soapy water, then leave it overnight in Chloramine-T, then rinse it with tap water and air-dry. If your tap water is undrinkable due to bacterial contamination (tap water usually is sterilized by the municipality with Chlorine or UV or ozone), then use demineralized water. Dermarolling / Microneedling / Crepey skin on inside of upper arms? If the skin is too loose then a dermaroller cannot help - or not much. 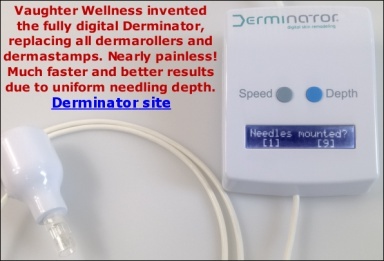 A dermaroller can improve mild skin laxity but cannot remove significantly excessive skin. Use a 1 mm dermaroller, densely about every ten days (body skin can be rolled more frequently than facial skin). Yes, it can take a long time to see results but the skin should be gradually getting tighter. It is very important to exercise the triceps. The triceps is in the inside of the upper arm and is usually neglected in “ordinary exercise”. Toned muscles will also improve the area. Yes, you should definitely use the A-Ret. Dermarolling / Microneedling / Vitamin C serum + Shelf life? L-Ascorbic acid in crystal form is very stable when kept cool, dark, dry and airtight. It can thus be stored for at least a year without significant degradation. Vit. C solution keeps a month when kept airtight in the fridge. If you want to make a 10% solution, you need to use ten grams of vit. C per 90 ml of water. You could dissolve a flattened tablespoon of vit. C in nine tablespoons of water to get 10% strength. 15% strength would be achieved when using only six tablespoons of water. No, you do not need the A-Ret now. Roll your scar areas very densely every three weeks. Apply vit. C for at least three consecutive days before dermarolling to ensure the maximum levels for the rolling day and then apply it at least twice a week. If you do not get any improvement within four months, buy a 0.5 mm dermaroller and use it twice a week on your area (and continue with the 1.5 mm as well). You can also consider needling the scars with our single needles. In case of stubborn, non responsive scars, I recommend needling them and apply the A-Ret immediately after. Blood marks are completely normal after deep rolling or stamping. The recommendation of eight times is a general recommendation that can be adjusted according to the toughness or sensitivity of the skin. A dermaroller or dermastamp causes tiny microinjuries in the skin. The skin gets red and some deeply, densely stamped spots can stay red for a long time – it is totally normal. The body will heal the micorinjuries and as a side effect of this healing, the scar often becomes better than before. This is the principle of dermarolling. A red scar will look worse for some time after dermarolling until it completely heals. It is not possible to say in general how long it takes. It depends on how deep and how much trauma there was. It can take from one week to one year and in case of big wounds such as after serious accidents, burns etc it can take even more. The primary goal of our body is to survive and that is why the body makes sure our injuries are immediately fixed to prevent an infection and restore normal skin function. Wounds are sealed with scar tissue as quickly as possible. In case of mild injuries, the skin heals back to normal. More serious injuries are filled with scar tissue that doesn’t go back to normal since our body doesn’t feel any need to replace scar tissue with normal skin. Scar tissue is merely an esthetic problem. Repeated microneedling makes the body remodel the scar by making microscopic injuries in the scar that trigger new healing processes – as a result, the scar often softens and regain a more natural color. Microneedling tricks the body to re-heal the scar. Deep scar will however never disappear, it will only improve in appearance. A 0.5 mm dermaroller is efficient to treat hyperpigmentations (also acne post inflammatory pigmentation) and to improve an overall skin texture but if you intend to improve scars you need needles long enough to reach the dermis part of the skin. A 0.5 mm roller reaches only the top of the dermis. I would recommend you to use a 0.5 mm roller in combination with the single needles. You will roll your entire face with the roller (twice a week) and needle your deep scars with the single needles. You can use the single needles every day but do not needle the same scar more than once in four weeks. No, because the more needles a roller has, the more pressure you need to push them in, so there is a limit to the number of needles you can have in a roller head..
Dermarolling / Microneedling / How deep to push the dermastamp for burn scars? You do not have to push the needles all the way down in your case. The needles of our dermastamp are 1.5 mm long. To soften a burn scar, it is necessary to crush the hardened collagen fibers. You do not have to go very deep to crush those. Pricking the skin with needles always hurts because the skin is tough in order to protect us. It is actually very difficult to prick the skin. Yes, this can definitely be used on the skin or for dermaroller disinfection. Dermarolling / Microneedling / Need advice on stretchmarks and scars - and what is single needling? Single needling is effective for stretch marks but it is laborious. If you have little time, needle just one or a few stretch marks a day.